Join us, Geelong’s yoga studio and feel just how great life is when your body and mind are in harmony. 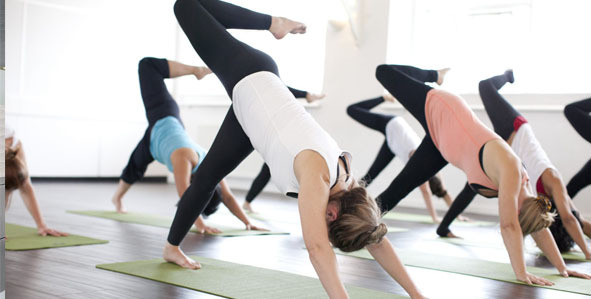 The list of health benefits of practising yoga is almost endless. You’ll sleep better, be in a better mood, lower your risk of heart disease and certain cancers, and reduce stress. Think better, feel better, live better. Research has found that yoga outperforms aerobic exercise by a long stride – helping to improve your balance, flexibility, strength, pain levels, menopausal symptoms, daily energy, and social functioning. It calms your mind and empowers you to live your best life – removing the conditions of your mind that hold you back and helping you to stay present and mindful. Visit our studio and talk to our instructors about your health goals. Many people exercise because they love sweating it out. This can be a reason why they don’t take up yoga – because they don’t categorise it as ‘exercise.’ Rather, in their mind, it’s just a soft, nice way to ease stress and make you more flexible. If you’re nodding your head, take a class in bikram yoga. 26 postures are practised in a 40-degree room, for 90 minutes. You’ll walk out feeling like you’ve just sprinted a marathon. It’s completed in a hot room to loosen your muscles and tendons, so you can move more. Sweat out the toxins in your body, while you’re twisting and bending. Don’t let the fear of heat scare you away. It’s scientifically designed to systematically work every part of the body. From massaging the internal organs, flushing out the cardiovascular system and stimulating the endocrine and nervous systems, to toning and stretching a range of ligaments and muscles in the body, the health benefits are extraordinary. That day, and those following, you’ll sleep better and be more energetic. In the long term, you’ll have overall improved physical and mental health. Is hot yoga the same as bikram? Although similar, there is a difference between hot yoga and bikram. Both are practised in a heated room, but with hot yoga, the teachers aren’t limited to the 26- pose sequence. It’s great if you want to sweat and are ready for a tougher workout. You’ll walk out drenched, but more energised as you’ve ever been. Just be careful not to push yourself too hard, even if you feel like you can move deeper in some poses. target your deeper connective tissues and fascia, restoring length, and elasticity. Instead of actively flexing or engaging the muscles, you’ll use props so your body can release into the posture. Soon, the restorative powers will have you hooked, so be patient. Yin is best for best for people who want to just stretch and unwind, without overdoing it. Don’t feel like you’re missing out on your treadmill or time on the exercise bike. Yoga is both exercise and meditation. It can aid weight loss, especially for its intriguing role in weight control through stress reduction. Chronic stress leads to changes in what food you crave and consume. This type of exercise provides many of the benefits associated with exercise, while also plummeting your stress levels. For one, it’s been practised for 5,000 years. Now, that’s a long time and it’s because of its mental and physical powers. We’re all struggling with energy levels in today’s busy world and yoga teaches you how to cope better with stress, by cultivating a sense of ease in both active or passive poses. Psychologically, it cultivates mindfulness by shifting your awareness to the sensations, thoughts, and emotions that accompany a given pose or exercise.  Increased muscle strength and tone.  Improved respiration, energy and vitality.  Maintaining a balanced metabolism.  Cardio and circulatory health. Ready to get started? Are you living in Geelong (VIC, 3220) and want to get into yoga? We’re your local studio. People from surrounding areas also practice here. They travel from places like Thompson, Breakwater, Newcomb, Manifold Heights, Herne Hill, Highton, Belmont, and Wandana Heights. See for yourself why this this practice has been around since ancient times. It’s one of the best things you can do for your mind, body, and spirit.